Are you a chocolate and toffee lover? Me too. As a kid, my mom loved Heath Bars. She always had a stash hidden in the kitchen cupboard. I loved the thin piece of toffee dipped in chocolate. 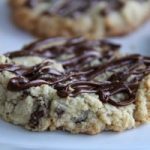 Toffee and Chocolate Chip Cookies with Salted Chocolate Drizzle is the perfect marriage of sweet, chocolate, salt and toffee. How good would that be in a soft and chewy cookie? So good you could eat the whole batch without sharing. Notice I said could, not would. Scoop and place on cookie sheets. Flatten out just a bit with your palm, then place in oven. This is one of my cookie baking secrets. right after they are out of the oven, reshape the cookies if they are not perfectly round. push the edges inward with a small spatula toform a neat circle. The cookies have to be hot, or they won’t be pliable. Sprinkle with coarse sea salt while chocolate is still soft. try to not eat the whole batch. Cream butter and sugars using low speed on mixer, just until smooth. Do not over beat. Add two eggs and vanilla. Mix just until incorporated and smooth, about 20 seconds. Add flour, soda, salt, Heath Toffee Bits and 1 1/2 cups chocolate chips to mixing bowl. Mix just until flour disappears. Scoop cookies onto cookie sheet, I used a 1 1/2 inch cookie scoop. Place on parchment paper or lightly greased cookie sheet. Bake for 10 minutes or just until golden. Remove and let cool completely on cookie sheet. After cooled completely, place the remaining 1 1/2 cups chocolate chips in a Ziploc bag. Microwave for about 30 seconds or until chocolate is softened and melted enough to drizzle. Press the melted chocolate toward one corner of the bag. Squeeze out any excess air, fold down the top of the bag and snip a tiny corner of the bag off. Drizzle the chocolate over the cookies and sprinkle immediately with flake or coarse sea salt. Let the cookies sit until the chocolate is set up. You're killing me. I want one of those right now SO BAD!! I may need to do some baking tonight. Kelly Exon made these for a homecoming last week. I only had 12. They were magnificent! My thighs thank you! ???? Love the Exon's! Only 12??? Delicious. You make the best cookies I have tried several. Thank you!